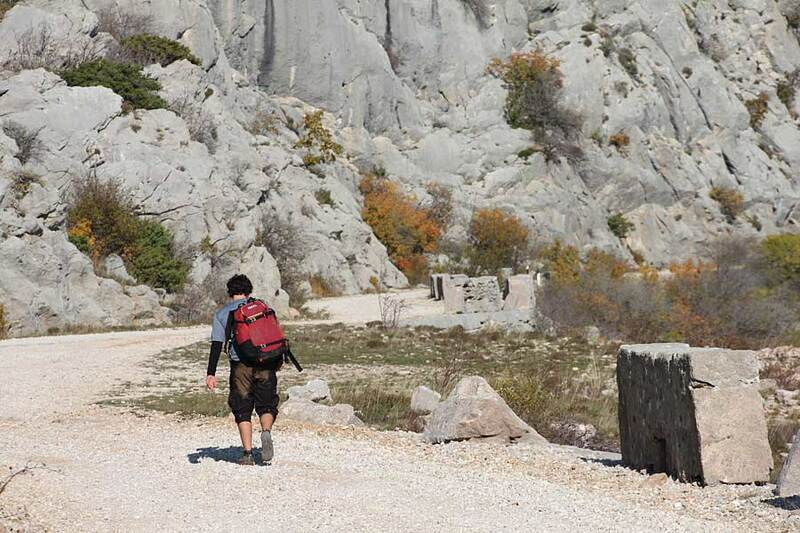 How to plan adventure in Croatia for 2000 EUR? Our Finn is a 23 years old British bloke. He works hard and he put some money aside for his adventure in Croatia. Finn loves UK, but the weather is not in his ‘top five things why I love UK’, so he pinpointed Croatia as a perfect sunny destination for this year’s me time. Also, Finn is not a big fan of crowds or party animal, so he decided that May is a good time to take vacation. And May in Croatia has a good sun-interesting people-activities ratio. Also, Finn is easy going guy, who loves meeting new people and hostel vibe. Logical question rises in Finn’s mind: ‘Ok, I have, let’s say, 2000 euro. Will I return to UK as a happy, relaxed person, filled with new experience?’ Finn, that’s a totally legit and interesting question. What can you do with 2000 euro in Croatia? Let’s see! Finn will fly from London to Zadar (European best destination in 2016, wink wink), for round trip with Ryanair he will spend round 50 euro, from 12. – 24. May. That’s around 12 days for chillaxing, more than enough to reset Finn’s mind and body. Note that citizens of EU and UK can enter Croatia with only their ID card. If travel guide book is your must have while visiting new countries, Lonely planet or DK Eyewitness Travel are your friends. Finn has a daily budget of 60 euro for accommodation, meals and bus, tram, train tickets. So, when Finn arrives to Zadar, first thing he needs is to find a place to sleep and since Finn is looking forward meeting new and interesting people, he opted for hostel. In May, a dorm in hostel ranges from 12 to 19 euro per night. If you’re not a hostel fan, Booking.com or Airbnb are good alternatives. And if you’re up for a total experience, Couchsurfing is perfect! Also, Finn likes street food and he will enjoy amazing atmosphere and tasty food in small konobas, no fancy dining. So, accommodation, food and travel tickets will relieve our traveller for additional 720 euro, give or take. Add 50 euro for the flight, and 20 for travel guide, total is around 800 euro. The beauty of Zadar, it’s architecture, Sea Organ and The Greeting to the Sun, friendly people, crystal sea and Croatian vibe are free, so Finn will enjoy it to the max for three days. On every corner there’s something going on, some interesting sight or happening. Now he wants to see top destinations outside Zadar. 1200 euro still in his wallet, let’s spend them in best possible way! Plitvice Lakes – Finn’s eyes would cry if they missed seeing this natural pearl. Entrance fee is 110 kunas (15 euro), small price for whole day in this watery paradise.Intoxicated by the beauty from the prior day, Krka National Park seems like a logical way to go further. He’ll be spending two days admiring another natural gem that is Krka River, with it’s magnificent travertine waterfalls. He’ll spend a night in a hotel, and with entrance fee for the National Park, he will go slightly over his budget. Returning to Zadar, Finn realizes this was a good budget overstep. Enough of travelling, it’s time for Zadar again. Finn decided to rent a bike and explore the Zadar surroundings, find hidden villages, beaches and soak up the sun on his own. Tired, but happy, he decides that beer is a good way to end the day. It’s his seventh day in Zadar, and by now he found his favourite bar. Even God took a break on the seventh day! Cheers! By now, Finn has spent roughly 1100 euro from his total budget but, we can all agree, it was totally worth it! He has 4 whole days ahead. What next? He met two guys from Argentina, they came here to party in Zrće on Pag Island. 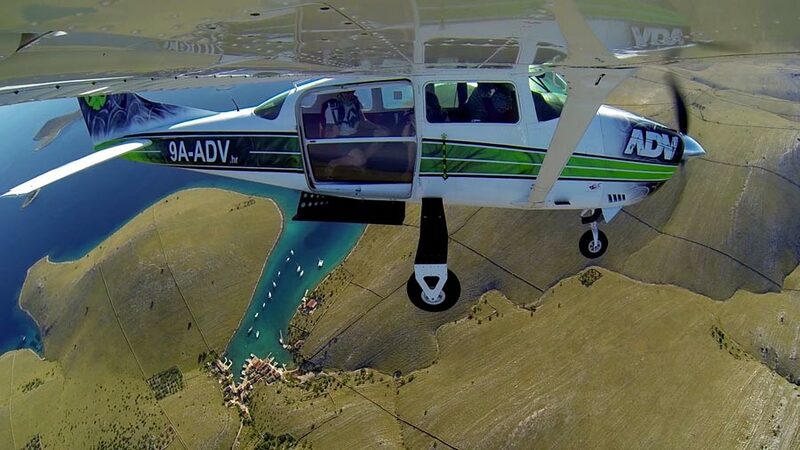 Party is not Finn’s cup of tea, but guys are interested in taking panoramic flight over Zadar and Kornati National Park. Sounds good! And it’s good, actually, it’s amazing! An hour of breathtaking scenery from birds eye perspective! Rest of the day was reserved for good food, cold beer and nice company. 150 euro down, one more perfect day in Zadar up! Finn woke up, and decided to take a trip and see Kornati again. Whole day trip by boat is round 40 euro, depending on the organizer. Cruising between these beautiful islands, sightseeing, swimming…Finn likes! ‘I’ve enjoyed the sea, now I’m up for some mountains and rocks’. 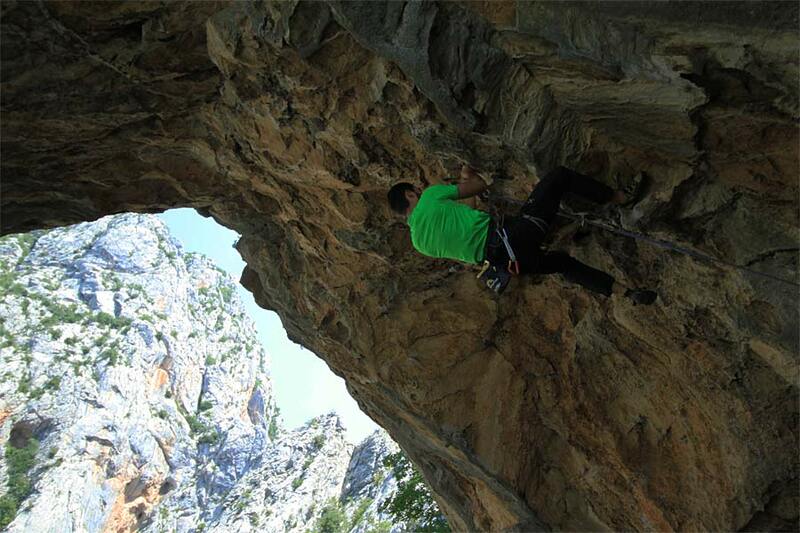 He heard that nearby Paklenica National Park is a great spot for climbing. Since he has no previous climbing experience, he decided that it would be nice if someone showed him some basics and spent some time with him while he’s making his first climbing steps. Imagine the smile on his face when he realized it can be done, he can try what it’s like to climb the rocks! His climbing instructor was this great guy, years of experience and a true passion for his job. He showed him everything he needed to know in order to climb his first route safely. Actually, Finn is some sort of climbing natural, so his instructor took him to some more demanding routes. Let’s say that we have a new climbing junkie right here! His flight back home is in two days, he has one more day in Croatia. 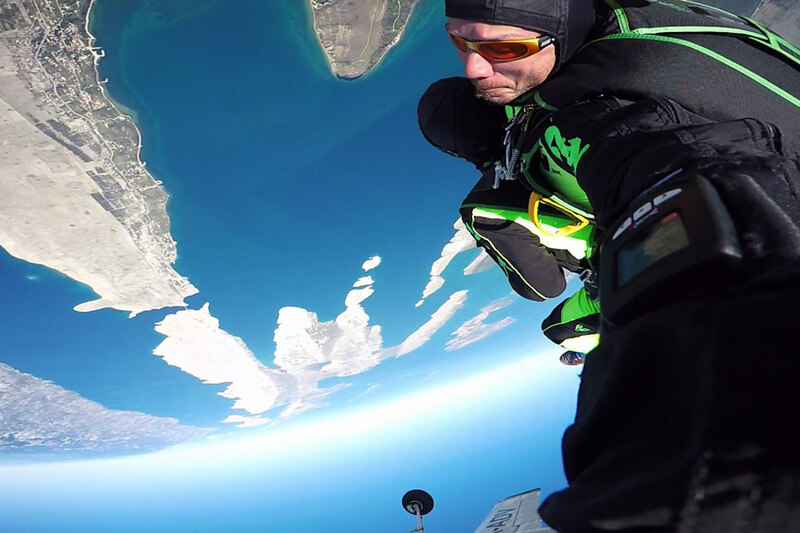 He was good to his wallet, so his wallet decided to treat him with his long due bucket list item – a tandem skydive! Well, if jumping out of a perfectly good airplane isn’t the best way to end his vacation, nothing is! 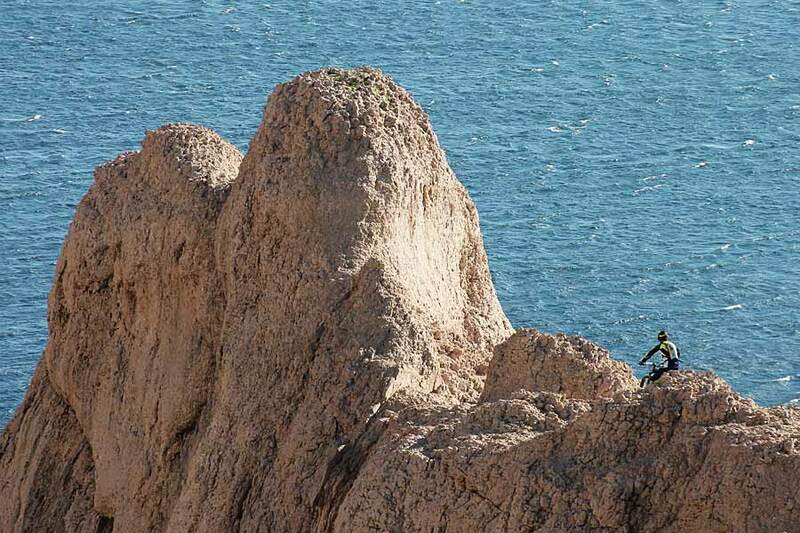 So, his final adventure in Croatia is the ultimate adrenalin experience. He was nervous at the beginning, but once he met his tandem instructor, all his fears turned into excitement and fun. He finally experienced free fall, crossed skydiving of his to-do list and just can’t seem to get this smile of his face. On his flight back to London Finn can’t wait to show photos and videos he made and got during his stay in Zadar. But most of all, he is happy he made new friends, experienced Croatia and tried new and exciting things. His wallet is glad that his travel diet is over, time to get fat again. There’s a whole world out there, just waiting for Finn to pinpoint his destination.